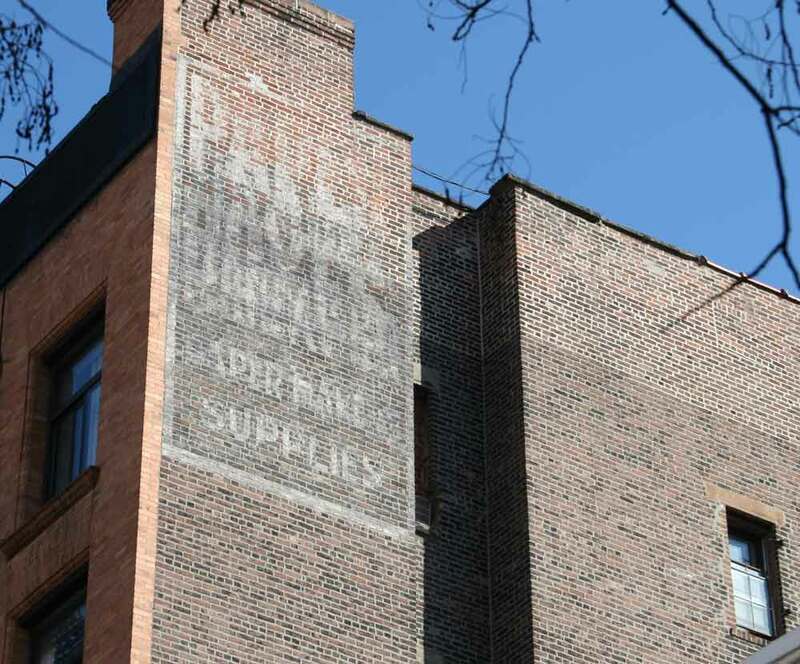 There has been some overpainting here, and the name of the company is barely readable, but at the top reads PAPER BOXES on this building at 22 Jones St. in Greenwich Village. And this was the home of Schenk & Schlichte, paper box manufacturers from 1896 to 1920. Schenk & Schlichte, paper boxes, began in 1879. Their original location was 147 Spring St. Later city directories listed them at 93-95 Sixth Avenue from 1882 to 1896. In 1920 Schenk & Schlichte left New York for Newark, New Jersey. This ad for Schenk & Schlichte in Newark appeared in the New York Times in 1922. The original partners at Schenk & Schlichte were George Schenk (1852-1910) and Arnold W. Schlichte (1850-1932). According to a passport application in 1904 George Schenk was born 9 December 1852 in Eisenach, Germany. He emigrated from Bremen, Germany, 25 March 1869, and he became a naturalized citizen of the U. S. in Brooklyn 9 October 1876. Schenk's death notice appeared in the New York Times, 10 August 1910, pg. 11, reading, "Schenk - On Tuesday, Aug. 9, at 6 A. M., George Schenk, beloved father of Lillian, Alma, and Irene, in his 58th year. Services to be held at his late residence, 169 West 92d St., on Thursday, Aug. 11, at 1 o'clock. Interment private." In 1908 Arnold W. Schlichte made out a passport application very similar to Schenk's. In it he said that he was born 6 May 1850 in Steenhagen, Prussia, Germany. He emigrated from Bremen, Germany, 5 October 1866, and he was naturalized in New York City 8 October 1874. Schlichte died in an automobile accident 8 February 1932. He was driving to Florida with his wife when they were both killed in an accident at South Langhorne, Pennsylvania. Another important figure at Schenk & Schlichte was Robert Martin Zoller (1872-1943). Robert Zoller was an officer at Schenk & Schlichte from around 1910 and was listed as president of the company in Polk's New York City Directory in 1916. Zoller was born in New York, and was recorded in the 1900 U. S. Census as age 26, "Foreman, Box Factory." His death notice, New York Herald Tribune, 20 April 1943, pg. 22, read, "Zoller - Robert, on April 19, 1943, at the Lutheran Hospital, husband of the late Katherine Kahrs, devoted brother of the late Rev. Herman Zoller, Mrs. Amelia Peterman, Mrs. Bruno Schmidt, Mrs. Frieda Windecker and Mrs. William Ramm. Services Jacob Herrlich Sons Memorial Chapel, 332 East 86th St., Wednesday, 8 P. M. Interment Lutheran Cemetery." Listed as president of Schenk & Schlichte in 1915 was William Francis Clare (1865-1935), a lawyer in New York City from 1877 until his death in 1935. Clare's obituary in the New York Times, 12 Dec. 1935, pg. 25, read, "William F. Clare, a lawyer, with offices at 7 Dey Street, who had been a member of the New York Bar since 1887, died yesterday at his home, 1,165 Fifth Avenue, after a long illness, at the age of 69. He is survived by his widow, Mary R. Clare, two sons, N. Holmes and William F. Clare Jr., both lawyers, three sisters, Mary E. and Lillian Clare and Mrs. Joseph Mulligan, and a brother, James L. Clare. A graduate of New York University, Mr. Clare, early in his professional career, formed a partnership with the late James F. Campbell, and the firm of Campbell & Clare became well known for its practice in estate and realty matters. After the death of his partner, Mr. Clare continued alone. He was a trustee of the Catholic Institute for the Blind and a leading member of the Catholic Club of the City of New York. He also belonged to the State, City and County Bar Associations, New York Law Institute, Manhattan Club, New York Athletic Club, and the Friendly Sons of St. Patrick."